For an outsider, it’s easy to wonder what is so bad about spending 12 months in service of the nation. But there must be some reasons for Russian young men aged 18-27 to leave no stone unturned in their attempts to dodge compulsory military enrolment. In his recent article about proposed military reforms, Vladimir Putin has remained non-committal on removing conscription, while his opponent Mikhail Prokhorov has gone to the extent of promising an end to compulsory military enrolment by 2015. 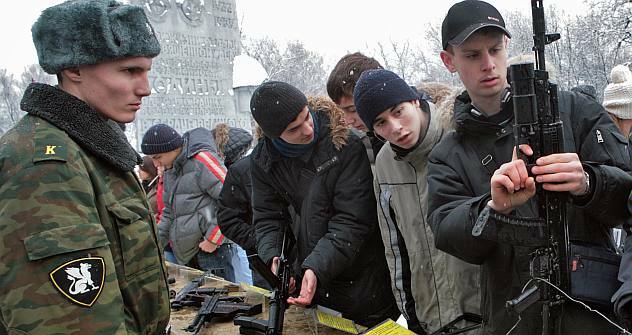 This is obviously not an issue that has the power to win or lose an election, but each year, many young Russian men between the age of 18 and 27 dread the thought of serving in the armed forces and look for innovative ways to avoid the military. Pre-1991, it was mandatory for men to serve 4 years in the armed forces and there were very few ways (if any) to avoid service. The Russian Federation liberalised the rules and gradually changed the requirement from 2 years of service to 18 months to the present one year. The latest rules removed several kinds of exemptions, like the one that allowed a father of a child below three years of age to avoid service. For an outsider, it’s easy to wonder what is so bad about spending 12 months in service of the nation. But, over the span of 4 years, my interactions with people in my age-group were eye-openers into the world of the military and draft-dodging. Alexei (name changed), a young man from the port city of Kholmsk in Sakhalin, spent 6 years avoiding the draft. His elder brother served for 2 years near Magadan in the outer Russian Far East and the experience seemed to have left him with psychological wounds. I heard tales of how the concept of dedovschina (hazing) didn’t stop for the first 6 months. Alexei’s brother, Maxim, who had a reputation for a temper, lost 2 teeth while in service and insisted that the ones hazing him were let off from prison early in order to meet a manpower requirement in one of the most remote areas of the country. The officer in charge kept telling Maxim to stop complaining and to behave like a real man. “I could have handled peeling potatoes, construction work for a general’s villa and even standing in a room the whole day in front of a senior officer,” he said. “But it was physical and psychological abuse in the coldest parts of the country that nearly drove me insane.” A classmate of Maxim’s who had good connections served two years in a border guard post, just a hundred kilometres away from home and his responsibilities involved processing and stamping permits for oil company workers entering a sensitive area. The only problem he faced was in getting a new domestic passport but he had saved up enough money to grease a few palms. Other ‘lucky’ friends of his, found other ways to dodge the draft. “One friend from university, paid $5000 to the federal army medical examiner, who deemed him unfit for service,” Alexei said with a sarcastic grin. The ‘rates’ for a failed medical exam were cheaper on the Far Eastern mainland, where there were no oil companies. Mikhail, another young man who got to 27 without serving in the army, did not have to pay a single kopeck to avoid service. A gifted athlete, who used to take part in skiathons, Mikhail injured his shoulder while trying out a new stunt. He had the medical papers to prove his accident and carried them with him on draft days, long after he had healed. During the medical examination, however, there was no way that the examiner could prove that Mikhail’s shoulder had completely healed. That was enough to avoid service in far away Chukotka. Vladimir Putin’s article on military reforms emphasises the need for a professional Russian army. With a dwindling population, it is imperative that pay and more importantly working conditions are improved enough in the Russian armed forces to make it a lucrative career option. The present top military brass consists of well-educated professionals, but the brighter lot among the younger generation leaves no stone unturned to avoid even temporary service in the army. At a time when the rich and influential in Russia ensure that their sons avoid military service, a career in the armed forces is a hard sell. Ignorant provincial politicians don’t help the army’s cause either. During a ‘posledni zvonok (last bell)’ high school graduation ceremony in Yuzhno-Sakhalinsk, I heard a deputy of the Sakhalin Duma (legislature) make an awful speech where he told the young girls that they were looking their beautiful best and the most magical days of their lives were ahead of them. He then told the boys that military service isn’t as bad as it’s made out to be and that country needed young men to guard the borders. My friend Alexei gently whispered in my ear that not only did that particular politician manage to get his own sons to avoid military service; he was one of the few people in then-Soviet Sakhalin, who managed to avoid time in the army! Author’s note: Senior military officials have denied reports of dangerous criminals being let off early from prison on the condition they join the armed forces.